One small portion of my invested portfolio is run as a ‘Dividend Growth Portfolio’ (DGP). I kicked off this portfolio in early 2013, and have run it pretty consistently ever since. It’s time for my first ever ‘deep dive’ into how this portfolio has been performing. To own Dividend Champions, and their ilk, with a strong likelihood of growing their dividend over the short and long term. I have been a longtime admirer of the Dividend Champions, who are the ~100 publicly listed US companies that have raised their dividend for 25+ years in a row. The UK has hardly any companies that can boast of this track record, and the UK approach to paying dividends (interim + final, rather than 4 equal quarterly instalments) makes the UK fiddlier to monitor for shallow analysts like me. I will certainly consider shorter track records than 25 years, such as the Dividend Achievers, Dividend Contenders etc, but for true quality you need Champions. You will note that there is nothing in this approach that prioritises high yield payers. In fact US companies tend to have lower yields than UK companies. Much as I like dividend income, for this strategy I am prioritising predictable growth in dividends, not the level of dividend itself. This portfolio was one of my early uses of leverage, though in a very modest way: I used to leverage up the portfolio by one to two year’s worth of dividends (i.e. 2-5%). In late 2015 this approach changed as I leveraged up across the board to buy my Dream Home and by 2016 my leverage for this portfolio had risen to over 40%. As rates have risen, I have reduced my leverage, so right now the Loan to Value is around 30%, and I am in fact paying almost as much interest (~3%) as the after tax dividend yield of the portfolio. My initial set of about a dozen holdings comprised stocks like AXP, CAT, KO, MCD, T, VZ, WFC, with a smattering of IBM, GE in there too. Sizing my positions has been very ad hoc. How many ISA millionaires are there? A new UK tax year has just begun, and with it a new annual ISA allowance of £20k each. ISAs are an amazing tax-break for investors who are UK taxpayers. I love them, and have a goal to get my ISA portfolio to £1m+. I’ve been posting updates annually about this (e.g. here, and the one before). Why is being an ISA millionaire cool? The £1m mark is just an arbitrary number, after all – unlike UK pensions which are capped for most of us at £1m. A million quid maintains an allure, even after the ravages of inflation. And sensibly invested it should produce an annual income of £35k-£40k, tax free – whereas a £1m pension’s income is taxable, if it is taken. Since the government lifted the allowance to £20k per person a few years ago (an un-noticed marriage tax break for wealthy, i.e. mainly Tory, voters), even ignorant ultra-conservative investors using just Cash ISAs can become ISA millionaire-couples in ‘only’ 25 years. But their £million won’t be worth as much as it would have been when they started, and they won’t benefit from tax-free compounding over the 25 years. ISAs in their current form started in 1999, when they replaced other tax-friendly savings arrangements such as PEPS, TESSAs. Any single person who’d topped up their ISA to the maximum every year since 1999 would have, if they have just topped up their 2018/19 ISA, invested £206k in their ISA. If this money was invested in a low-cost FTSE All Share index tracker, with no withdrawals, it would today be worth around £380k. A married couple who have doubled up the whole way will be sitting on a combined ISA pot of double this, which is over $1m. 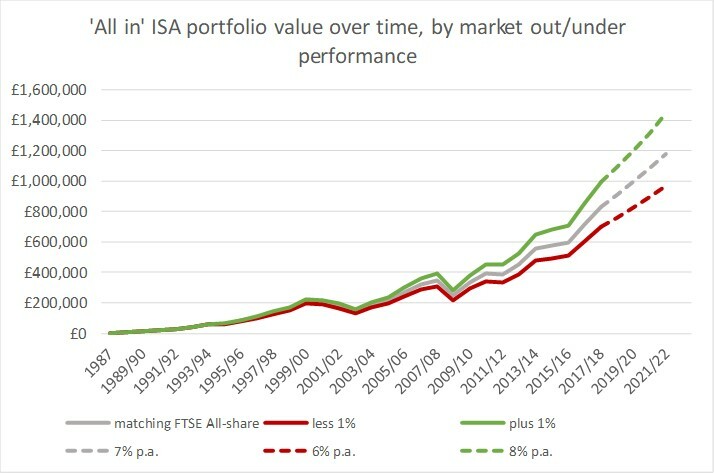 So, in dollars, a pair of wealthy ISA-loving investors would be ISA millionaires if they have achieved market average returns over the last 19 years. Being an individual ISA millionaire in pounds is much harder. But if you were saving hard using the PEPs/TESSAs that preceded ISAs, you had a crucial starting advantage. This is one of the ways that the most famous UK ISA millionaire, Lord (John) Lee did it. But if, once ISAs came along, you achieved only average market returns, you’d have had to begun your ISA journey with £187k of savings. How could people have begun their ISA journey in 1999 with £187k savings? The Capital PEP, which would have been the best vehicle to have used, started in 1987 with an annual allowance of £2.4k. By 1990 it had risen to £6k. But this means the most you could have invested before 1999 was £64.2k. What were the chances of turning £64k into £187k in 12 years? As it turns out, the chances were very good. The 1991-95 boom saw the FTSE All Share return over 20% per year in four of the five years. So an ‘all in’ PEP investor, achieving average returns, would have had £159k in their ISA account on day 1. Maintaining average returns and continuing to be ‘all in’ would have got them to around £850k today. In fact, an ‘all in’ investor like John Lee would have only needed to outperform the market by 1% per year in order to cross the £1m threshold, which they would have done in the last 12 months. Outperforming the market by 1% per year is no mean feat, but there are certainly countless UK investors who have done it. Of course, in the recent Brexit-y era, the more of your investments were outside the UK the more you’ll have beaten the UK market.